If you read faster than me (which is to say, you don’t have to read some sentences 5 or 9 times before you understand them), you can get through these before the primaries are over. Either way, if I was a college professor teaching an interdisciplinary course on contemporary values that you might be interested in auditing, this would be the syllabus. All the titles just came together that way. Kinda uncanny, really. 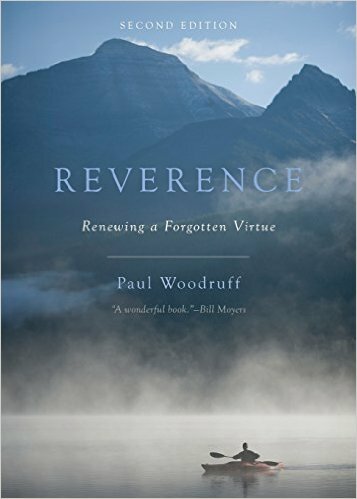 Reverence: Renewing a Forgotten Virtue, Paul Woodruff. Voting is a ceremony. It is an expression of reverence – not for our government or our laws, not for anything man-made, but for the very idea that ordinary people are more important than the juggernauts that seem to rule them. If we do not understand why we should vote in this country, that is because we have forgotten the meaning of ceremony. And the meaning of ceremony is reverence. Woodruff is a specialist in ancient Greek philosophy. You remember those guys, right? Invented democracy? I’ve had this idea for years now that the Big Problem is etiquette. A more casual America has done us a lot of good. But there’s always a cost, and manners have certainly suffered. I found this book circuitously while researching some ideas for the next album, and now I realize I wasn’t going deep enough. I got it now. The Righteous Mind: Why Good People are Divided by Politics and Religion, Jonathan Haidt. A touch pop psychologish for my taste, but my opinion of this book is now colored by Reverence, which I got to later. Also, see The Psychopath Test. It did wonders for my frustration at the time about the topic and it’s great that the psychology of morals is a thing. It will make you look at yourself harder than you look at others, at least for a couple hours after you finish taking a couple of the online tests he designed for his studies. That said, you could skip it for Woodruff’s masterpiece. Unless you’re absolutely certain you’re not the slightest bit racist. I used to judge people for their lazy choices, which, in effect, was me merely judging myself for having the capacity to treat my body so poorly as to eat the burger sandwich of laziness. I believe we all have the capacity for such mediocrity, which is why those motherfuckers are making so much money off us. A very fine sequel to Paddle Your Own Canoe and let’s face it, we could use a laugh by now. See Zen and the Art of Motorcycle Maintenence, “gumption trap”. The Psychopath Test: A Journey Through the Madness Industry, Jon Ronson. I used to think psychiatrists were really cool. Then I got to know one. She turned out to be a complete sociopath, a term she insisted I did not use properly. I was totally using it properly. Anyway, it’s still a cool field and I’m sure they aren’t all psychopaths. But I’m not taking any chances. Thanks for what must have been incredibly difficult research, Jon. Also, belated thanks for The Men Who Stare at Goats (See A Model Psychosis, “A Snake Under Every Stone”). Vindicated twice by one author, nice. Make that three times, because I’ve thought for years that there are even more psychopathic CEOs (and politicians) than there are psychiatrists. See? I told you it all ties together! Zen and the Art of Motorcycle Maintenence and Lila, Robert M. Pirsig. The idea that “all men are created equal” is a gift to the world from the American Indian. I think present-day reason is an analogue of the flat earth of the medieval period. If you go too far beyond it you’re presumed to fall off, into insanity. And people are very much afraid of that. I think this fear of insanity is comparable to the fear people once had of falling off the edge of the world. If you can’t distinguish between good and bad in the arts they disappear. There’s no point in hanging a painting on a wall when the bare wall looks just as good. There’s no point to symphonies, when scratches from the record or hum from the record player sound just as good. This was my 3rd or 4th reading of Motorcycle Maintenence. You always wanted to read it, didn’t you? But you never got around to it, did you? Pirsig was found to have an IQ of 170 when he was a kid and was accepted into the University of Minnesota at 15. Molecular biology. At FIFTEEN. This was before people thought you could classify somebody like Jack White as a genius. I would argue that Pirsig is even more of an authority on ancient Greek philosophy than Paul Woodruff. Paul is an incredibly accomplished scholar, but he’s not a bona-fide GENIUS. I take it back, Woodruff is the authority of the two. But Robert actually thought through all of it. Now, you could probably manage to do that with a 150 IQ, but it’s gonna take another 20 points to then turn around and write about it using a narrative form that anybody who can get through a sentence after 5 or 9 tries can not only follow but actually ENJOY. This was only my 2nd time through Lila, but I have to wonder if the reviewers that claim it isn’t as “good” as the original classic really got the original classic. Or find the 2nd movement of Beethoven’s 9th “disappointing”. Get to this title ASAP and arm yourself with a Quality samurai sword – when Pirsig’s ideas are fresh in your head, it’s refreshingly easier to cut through all the rhetoric. See what I did there? I’m telling you, it all ties together.